Love Bird debuted in 2009. 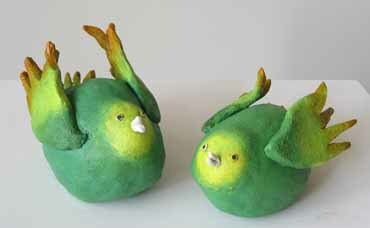 They are hand-sculpted from clay, kiln-fired, and then painted. They are similar to one another, but each has its own idiosyncrasies and unique facial expression. Each one is approximately 2.75″ x 4.75″ x 3″. 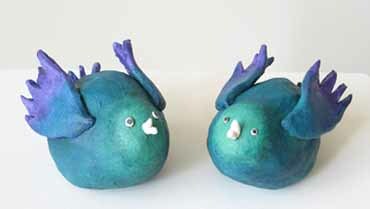 *** Note: 40 Love Birds were made and they have all been SOLD. If you are interested in something similar, please see the Singing Bird. is powered by	WordPress 5.0.4 and delivered to you in 1.719 seconds using 30 queries.